Dear readers, you’ll be relieved to hear I prepared an acceptance speech and left it on the London Underground. Three years of WordPressing – a lot of fun and a great deal of hard work. Pretty pictures don’t make themselves, but if they did, they might be a bit less over-saturated. I hope this little blog brightens your day in some small way. Cheers and thanks for following. Ok, it says ‘1 year old’, but this is last year’s birthday card, and I can’t be bothered changing it to a ‘2’. It’s a lot of work (some people think it’s a real neon sign according to Pinterest!) I’ve had the best time blogging on WordPress, meeting new people and making connections with like-minded people around the planet. I’ve had an instant and appreciative audience for my photography, videos and artwork and even some music that I’ve made. We’ve been visited by the famous, and featured in French newspapers and Freshly Pressed. 99,000 hits, 876 followers and 8 awards… blow that trumpet. Here’s to many more years of The Vibes! 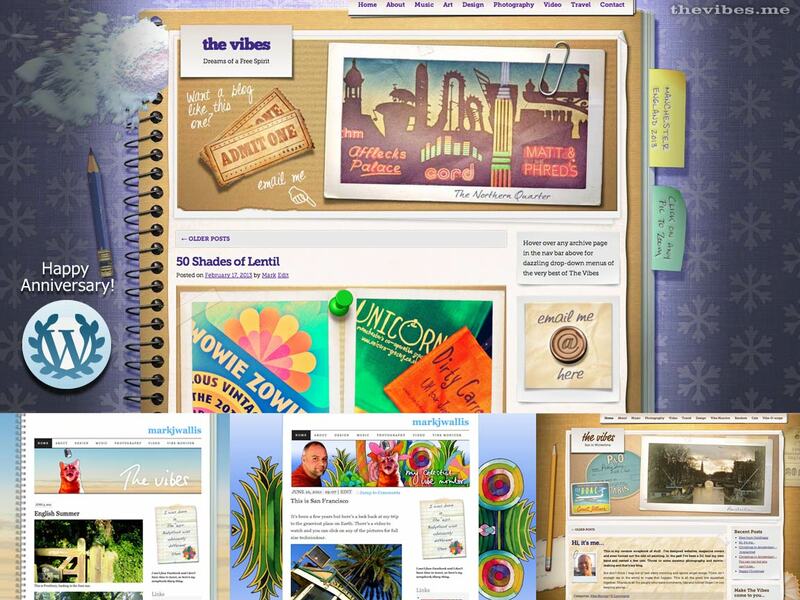 Zoom here to see how the design of this blog evolved from humble beginnings. Break out the bubbly, because The Vibes has been vibrating for a whole twelve months. The best thing about blogging has been connecting with artists, photographers, poets and other creative types. I love the Nature, Photography and Art pages: that’s where I find the wow factor. The worst thing is the hate speech on the ‘religious’ topic pages. There’s a lot of people out there with issues and it ain’t pretty. The hardest thing was customizing my theme until I’d wrestled the Adventure Journal into something that reflected my personality. I’ve managed to build myself a bit of a profile on WordPress, shown off my artwork and photography and upset some Cross People. It all began with a modest post about sprinkling the ashes of my beloved cat around Merlin’s Well in Alderley Edge. I think the Wizard and King Arthur would be proud of the travel/photography scrapbook which has emerged since then. And it has to be said: when I press Like, it means I really like something and I’m not just being a shameless blogtrollop. So, hi to all my followers, thanks for sticking with me and here’s to another year! Now. Is there an electrician in the house? For the best of The Vibes in pictures, click here.